PROFIRE USA delivers professional firearms training across the full spectrum of courses for beginners, those who are seeking a concealed handgun permit, defensive handgun, advanced and instructor training. 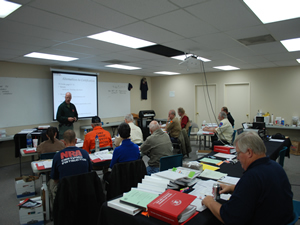 Courses include all of the NRA student and instructor courses plus many non-NRA approved courses of our own design. Ask your family, friends and coworkers. Ask around. Chances are that you know someone who has trained with us in Colorado, Wyoming, Kansas, Wisconsin or Florida. Many of our students have left their comments and reviews for you to read. Our focus is on adding and delivering value. In addition, we value your time. Even our website is designed with that in mind so that you can get in, find out what you need to know, select a course, register and go! Don't settle for what we call a "coffee & donuts" course. Some instructors go through the motions and you end of with little more than a piece of paper. Most new instructors start out with just the BIT + Pistol Instructor courses to become an NRA Certified Pistol Instructor and then add additional instructor ratings later. By starting out with our multi-day package of instructor courses, you should have a competitive advantage over them! Remember, if you have not already completed the underlying student courses, you can take them from us at discounted tuition. Call us for details! Click here to review our published Class Schedule and additional dates may be available upon request. 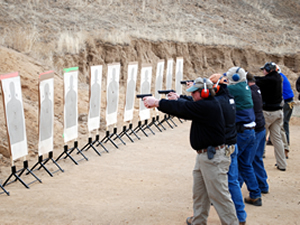 Do you need NRA Instructor Training for your group in Colorado or elsewhere? 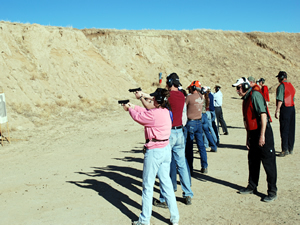 We can plan, schedule and deliver professional NRA Instructor Training plus RSO, CRSO and/or RTBAV Instructor courses to your employees or other group just about anywhere in the country with sufficient notice and class size. For example, we have done these "travel classes" for groups of 10 to 22 students in Utah, Wisconsin, Illinois and other states. Even if you have a smaller group that you need to train up in a series of instructor courses, it is likely that the money you save by not having to send them out of state across one or more trips will cover having our trainers teach the courses at your facility AND give you more seats in the program. Become an NRA Certified Instructor! You've been asked numerous times to help friends and family learn about firearms. It's time to "make it official" and become an NRA Certified Instructor! Purchasing 5 or more days of NRA Instructor Training in a multi-course package includes not only a discount on the tuition but also two incredible, separate gifts to get your firearms training business started and improve your skills! Professional website for your firearms training business including your own web domain name, custom email accounts, site created and ready for you to enter your content using only your web browser - it's easy! Hosting is included for the first year as well. This gift is essentially a surprise and you will definitely be truly amazed at its value! SO, how much will 5 Days of NRA Instructor Training cost you? Remember, if you added up all of the value and comparable value that you will receive, including the FREE GIFTS, it could easily exceed $3,000! As of July 1, 2018, the NRA now requires prior completion of the underlying student course before you may attend the corresponding instructor course. If you need the student courses, we offer them to our instructor candidates at the reduced tuition of $99 / day when added to your order for 5 or more days of instructor training. Don't worry about class dates because you can complete the courses on any of the dates that we run them in the next 12 months and you will have multiple opportunities for each course.